- On social media, Eric Drouet has shared videos against migrants and expressed arguments used by the xenophobic far right. Knowing that this could tarnish his new “respectable” image as a spokesperson of the movement, he deleted all his Facebook publications up to November 18. The [i]Arc de Triomphe[/i] was the focal point of confrontations throughout the morning. Police repeatedly tried to repel protestors from the historical monument, but not without difficulties, as evidenced by this scene in which a group of demonstrators charged an anti-riot police unit that was trying to protect the edifice. During the charge, one policeman was isolated from his unit and beaten up by yellow vesters. - Altogether, 412 individuals were arrested and 378 of them were put in custody. - It is difficult to tell how much ammunition the police used; numbers vary widely between sources. However, it appears that they deployed about 8000 tear gas grenades, 1000 sting-ball grenades, 339 GLI-F4 stun grenades, 1200 rubber bullets, and 140,000 liters of water during the confrontations. 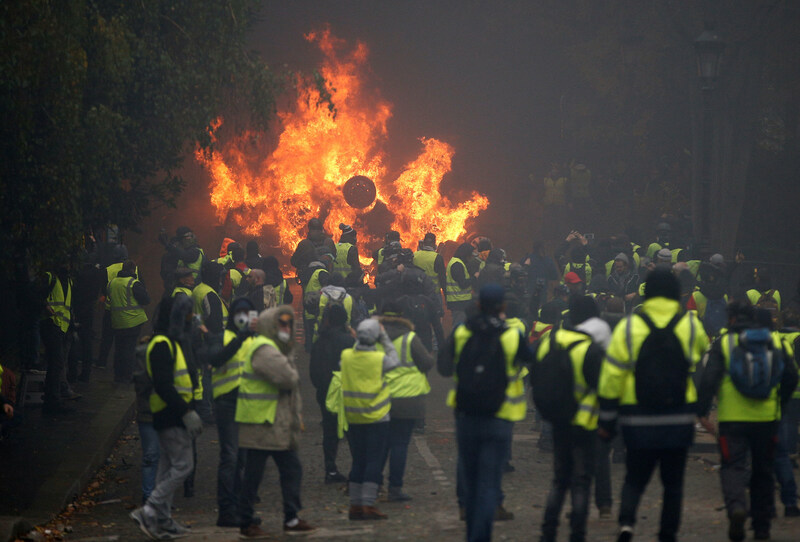 - In the end, during the Parisian demonstration alone, 133 individuals were injured, while the authorities counted 112 cars, 130 pieces of urban furniture of one kind of another, and six buildings set on fire for a total of 249 fires. - The total amount of property destruction could reach 4 million euros. In Marseille, the confrontations began at the end of the day. Protestors burned trash containers, smashed several shop windows, looted stores, set a fire in front of the city halls of the 1st and 7th districts, and finally set a police car on fire in front of the Canebière police station. It appears that 21 individuals were arrested after these actions. An 80 year old woman was killed when a tear gas grenade hit her in her face as she was closing her shutters. How do we engage in this struggle in a way that doesn’t weaken the movement, offering the advantage to the police? How do we remain focused on connecting with other ordinary participants in the movement rather than getting mired in a private grudge match with fascists?